My son and I are about to head out on our thru-hike of the John Muir Trail, and our resupply boxes are almost ready to go. Rather than carrying 14 days of food with us, we will be mailing supplies to ourselves along the way. It seems that backpacking sites tend to focus mostly on gear and trips (this one included). 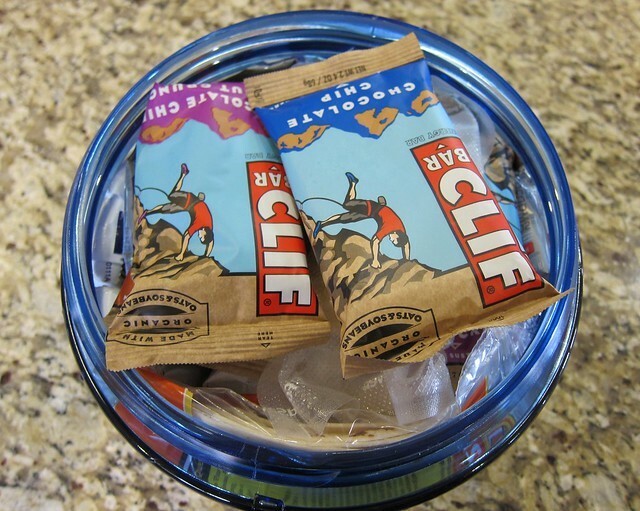 I don't think we see enough information on the very important topic of trail nutrition. You can make all the right gear choices to get your base weight down to "ultralight" status, then blow all the weight savings by carrying the wrong kinds of food. 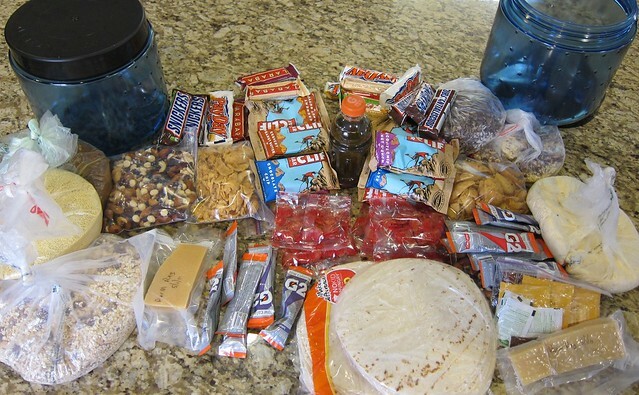 Pictured below is 14 days of backpacking food (7 days x 2 people). #1 Well balanced nutrition, high energy for 10+ hours of walking per day. 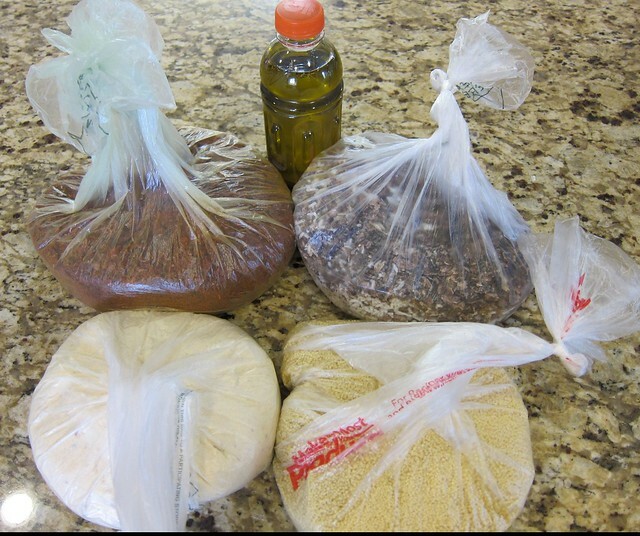 #2 Simple meal preparation on the trail. #3 Go as light as possible without going hungry. #4 Use as little stove fuel as possible. Breakfast consists of nuts, berries, dry milk...half prepared with couscous, and for variety the other half with rolled oats. 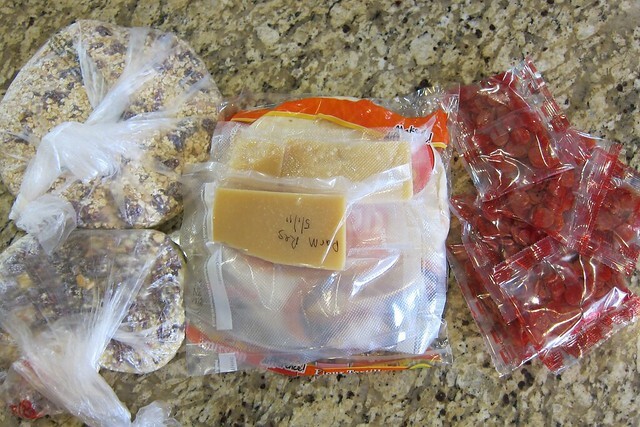 A favorite mid day snack is flour tortillas, pepperoni, and parmigiano reggiano cheese - kind of like a trail pizza! My idea for dinners was to be able to mix a few ingredients to create several different meals, and have meal preparation take just a few minutes. Pictured below is 14 days of dinner...clockwise from top left, Delight Sauce, spiced olive oil (thanks for the great idea Mike Clelland! ), black bean soup with instant white rice, couscous, and instant mashed potatoes (Idahoan Loaded Baked of course, everyone knows they're the best)...yum! Will it all fit? There's some strategy to this. Bars across the bottom, then some granular food to fill in all the gaps. Note that the bags of food are under-stuffed in order to squeeze into any available spaces. More bars and flour tortillas fit nicely around the outside, and the rest goes in the middle. It just fits, a weeks worth of food in this BearVault BV450 container, which is rated at 4 days capacity. Their larger size weighs a half pound more, and wouldn't fit inside my backpack. 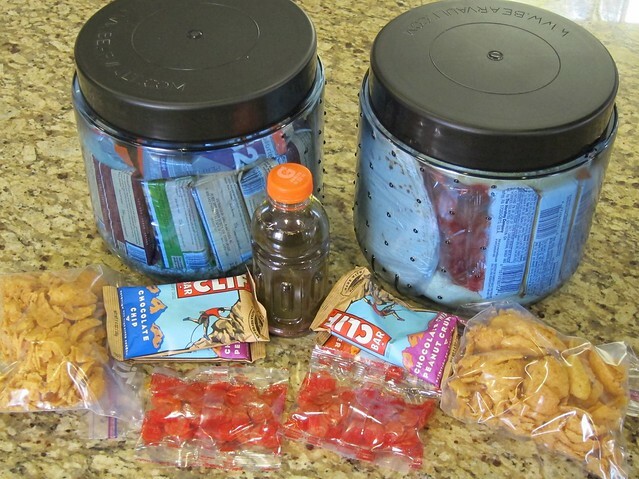 Some snacks are purposely left out for the day (food only needs to be inside of the bear canister if you are going to be separated from it). I'll have to find room for that bottle of spiced olive oil before the day is done, which shouldn't be a problem after dinner. Deatils details...yes I like them. My nutritional goals are to have lots of real food - nuts, whole grains, etc. I try to go with a balance of 50% carbohydrates, 35% fat, and 15% protein. The highest calories per ounce are from fat, but you need to try to maintain a decent balance. Don't worry if you don't hit your percentage goals dead on...they are just a target and a good way to see how different food choices affect your overall nutrition plan. For more detailed information on backpacking nutrition, check out this great article at Thru-Hiker written by a nutritionist. This is where I got my formulas for % of Carb, Fat, and Protein. They are obviously not perfect, as my totals add up to 103%. I just made a batch of your Moroccan Couscous. OMG! Too bad I have to dehydrate some. You hit that one out of the park. I'm really looking forward to sharing this experience with my son. Spending time with him on gear and training has already been a blast! It's so cool that you tried my Moroccan Delight, and even better that you liked it! Thanks for sharing! Hiking the John Muir with your son...doesn't get much better than that if you ask me. My son is 3 years and I can't wait until he's big enough to hit the trail with me. Fun times for sure! I really enjoyed the writ up on good trail nutrition. You're right, it’s often an afterthought for many new backpackers. You typically pay the price though when you don't put enough time into planning this part of your trip...I know this is true from personal experience! Enjoy hiking with your son...be sure to post pics from the trip! Thanks TG...my son is 15 and a great young man. I can't tell you how happy I am to be able to share this experience with him! Heading west tomorrow and starting Saturday morning. Is there a way to dehydrate food without a dehydrator? Some users try with oven and few other devices... but still it won't be that much good. I always use my dehydrator to dehydrate food. I recommend to get some good dehydrator to dehydrate food. Hey John, first of all I want to congratulate you on an excellent website with some great content. I am looking forward to trying your recipes. I noticed that you don't have an actual lunch menu. I'm guessing you just keep snacking all day to keep the carb\energy levels up? I will have to try that strategy instead of having a traditional sit-down lunch. I also noticed that you bring cheese. Isn't that heavy and doesn't it go bad quite quickly? Is the 9.6 lbs just the food or does that include the bear canister? Thanks for your reply. I think it included the bear canister. Love clif bars when I go hiking. Great source of protein all of that stuff. Also the bear canister is awesome. Well made trip chart. Bookmarking this link. This will help for my next trip. What about toiletries and trash? Shouldn't they find place in the canister as well? 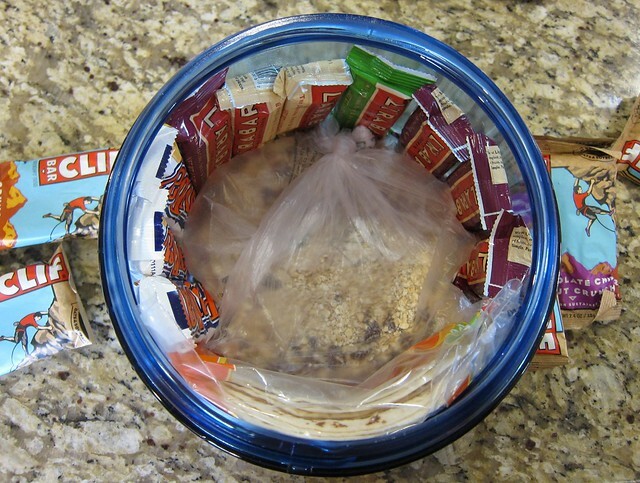 Make Your Own Backpacking Meals!